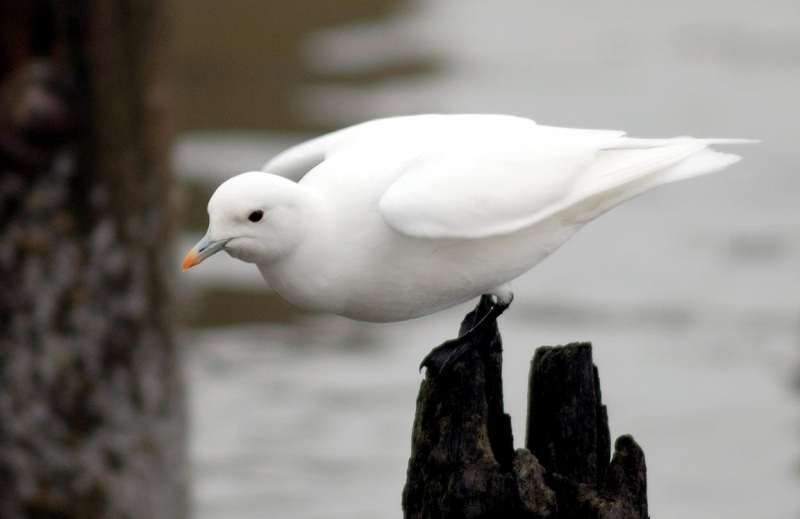 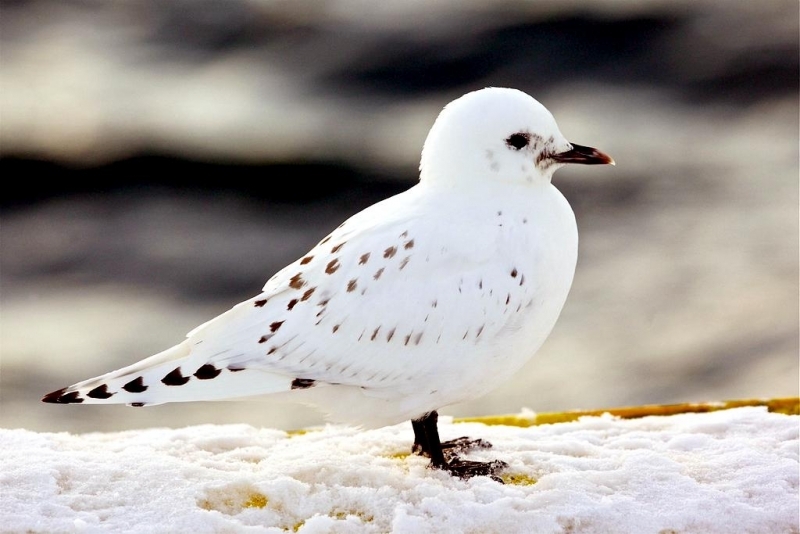 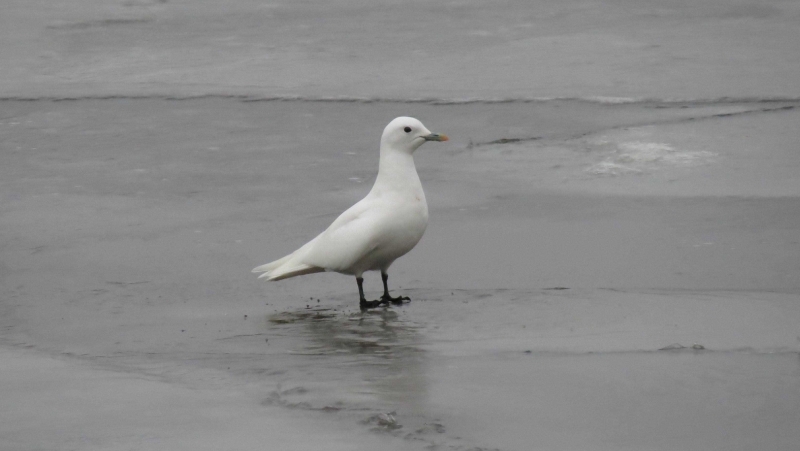 Appropriately named, the Ivory Gull is a small, white bird with black eyes and short, black feet that is found in the Arctic along northern Canada and Greenland. 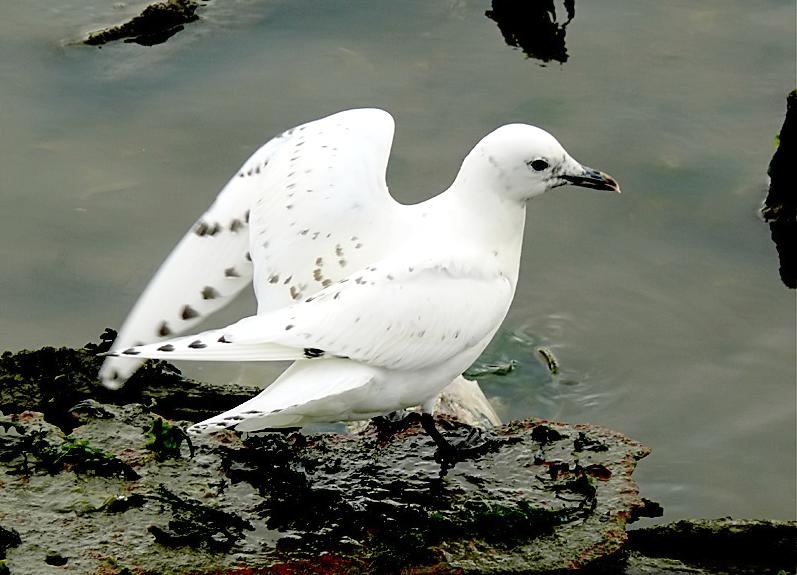 The bird is 17 inches (about 43 centimeters) long, weighs up to 24 ounces (about 687 grams) and possesses a wing span of up to 47 inches (about 120 centimeters). 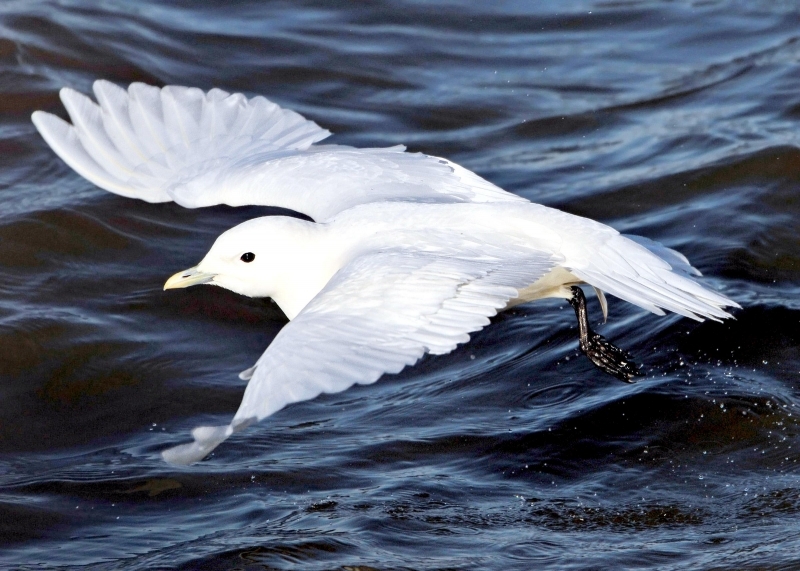 The Ivory Gull typically makes its home on packs of ice and has a lifespan of up to 20 years. 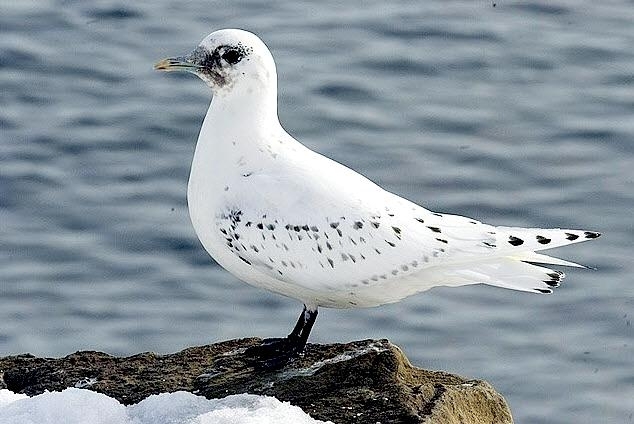 They become sexually mature after its second year, when they develop their distinctive white plumage. 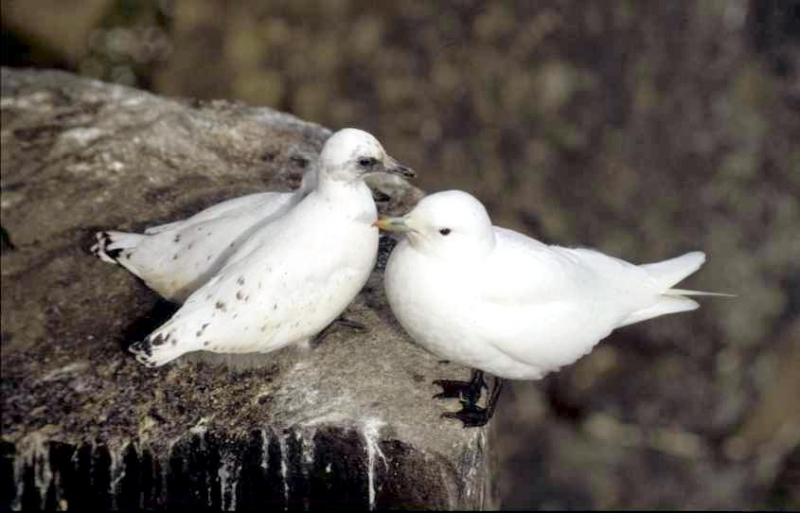 Males and females attract each other through mating calls, body language and ritual feeding. 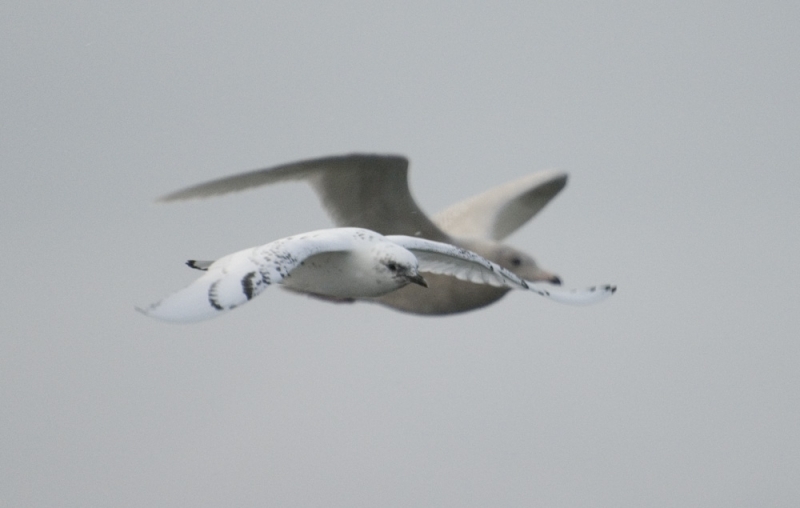 When Ivory Gulls find a mate, they are monogamous to each other. 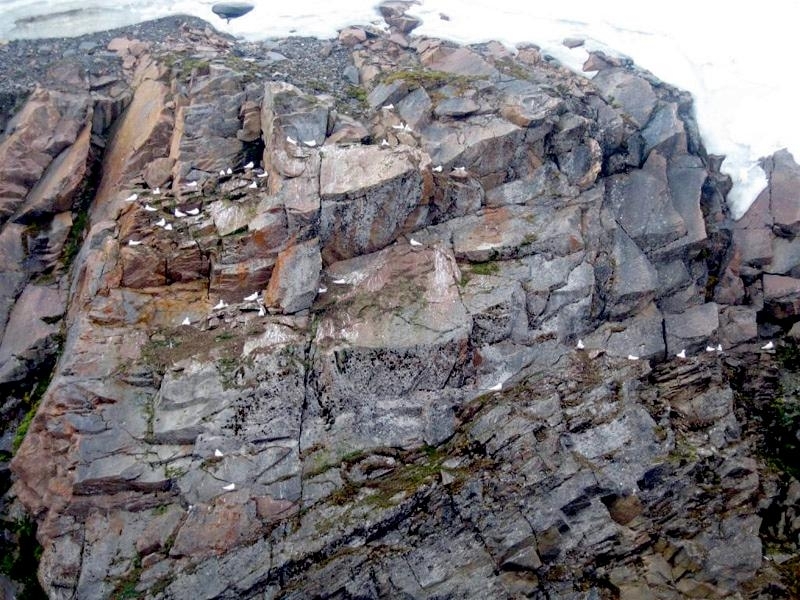 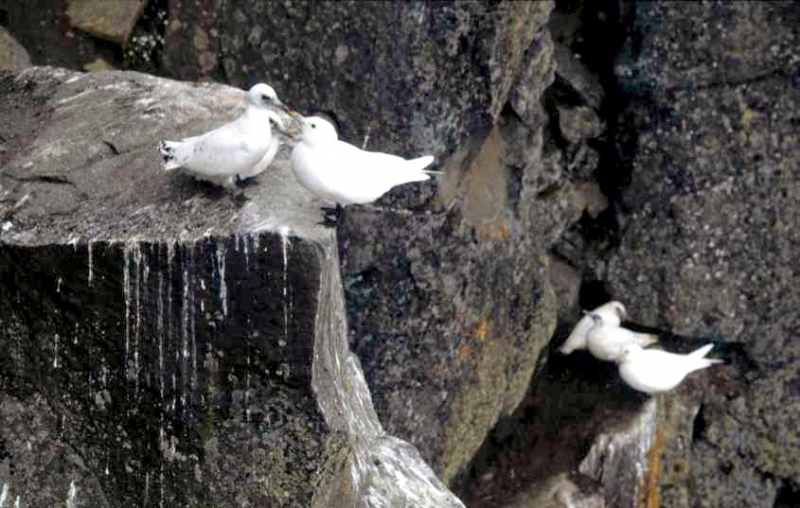 Breeding often occurs along rocks & cliffs near ice flows. 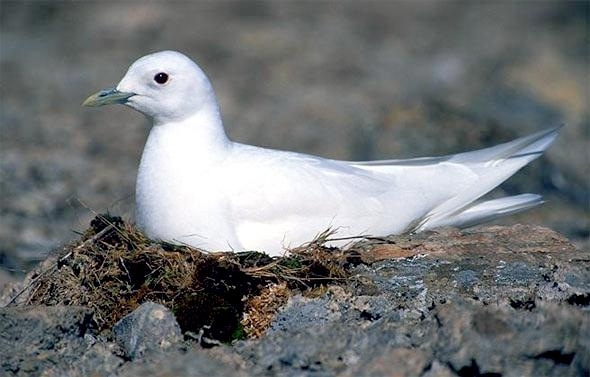 Both males and females aid in building a nest consisting of moss, seaweed and grass. 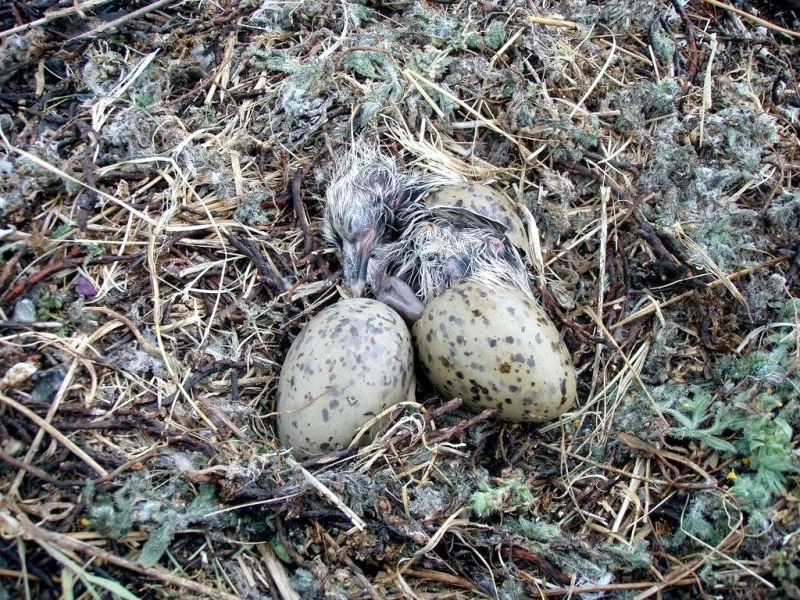 Females typically lay up to 3 eggs, which are dark or pale brown in color. 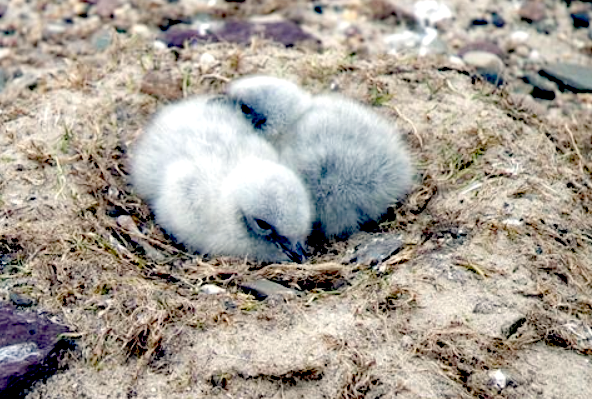 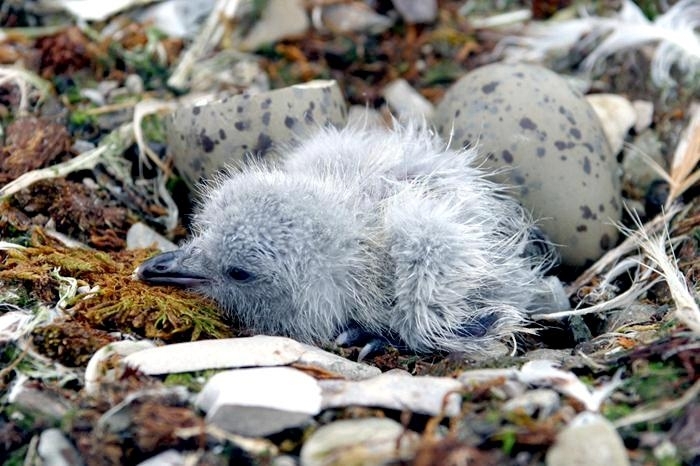 Both sexes incubate the eggs, which hatch in less than a month. 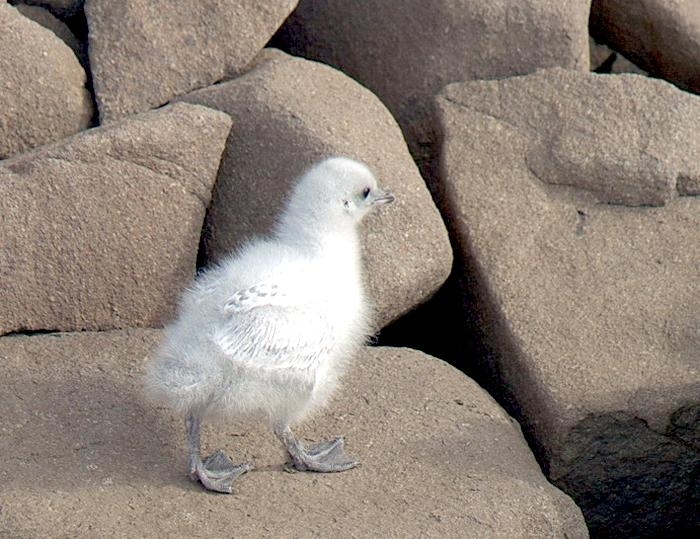 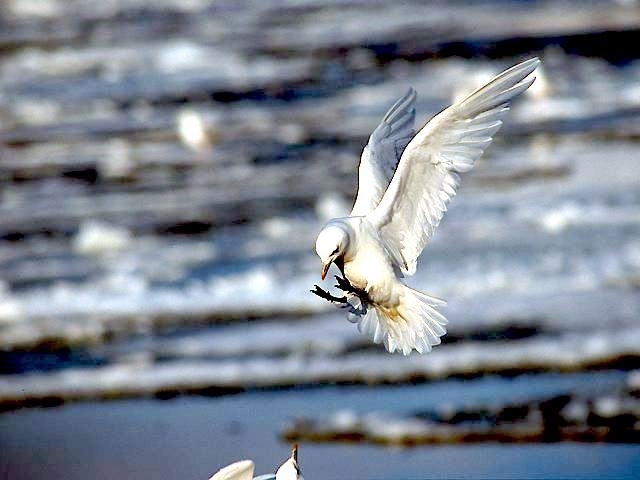 Upon hatching, the young Ivory Gulls are covered in white down and can feed themselves within 3 weeks and within 5 weeks, are able to fly. 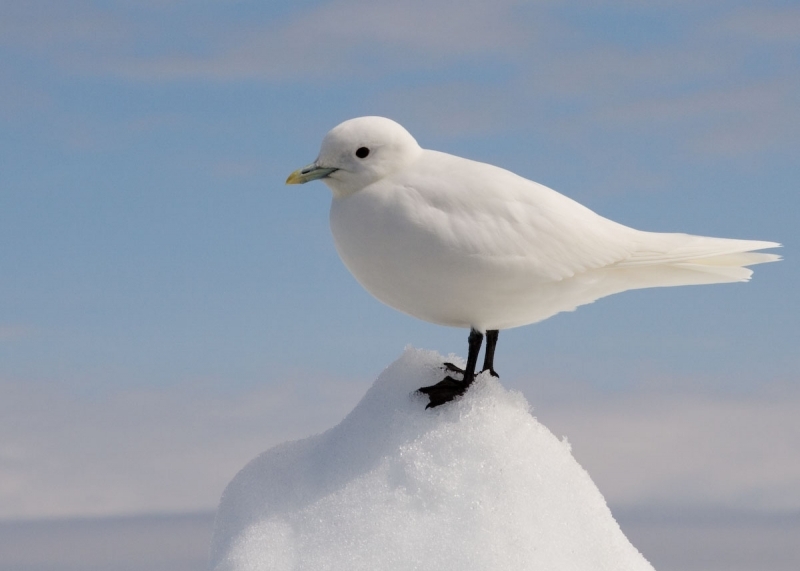 Living in the frigid temperatures of the Arctic, the Ivory Gull requires plenty of calories to meet its energy requirements. 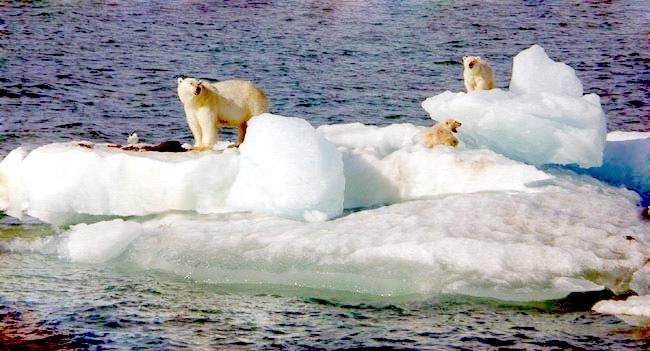 They will dig holes in snow & soft ice to protect itself from the freezing winds of the Arctic. 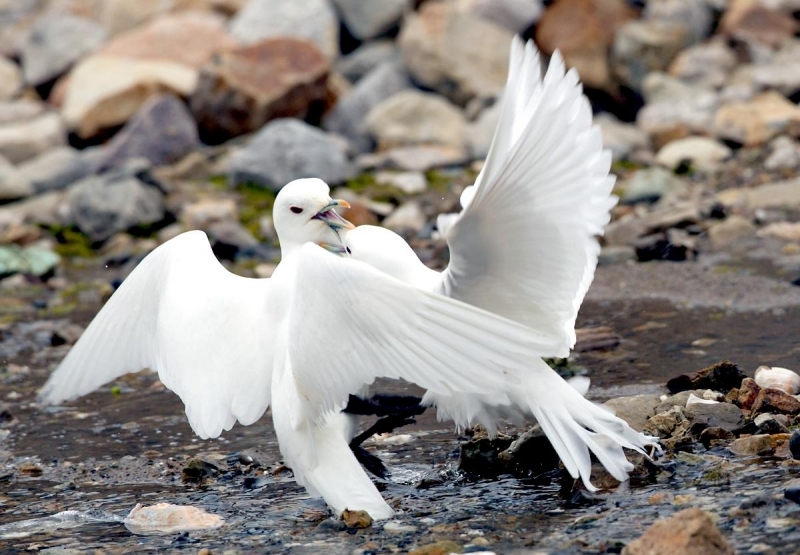 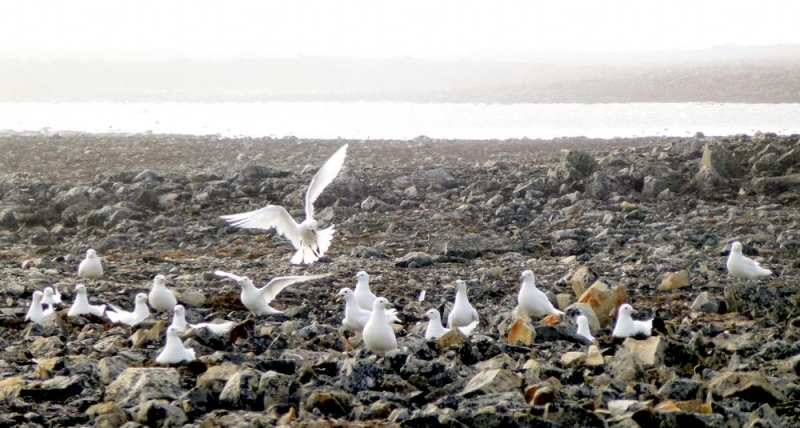 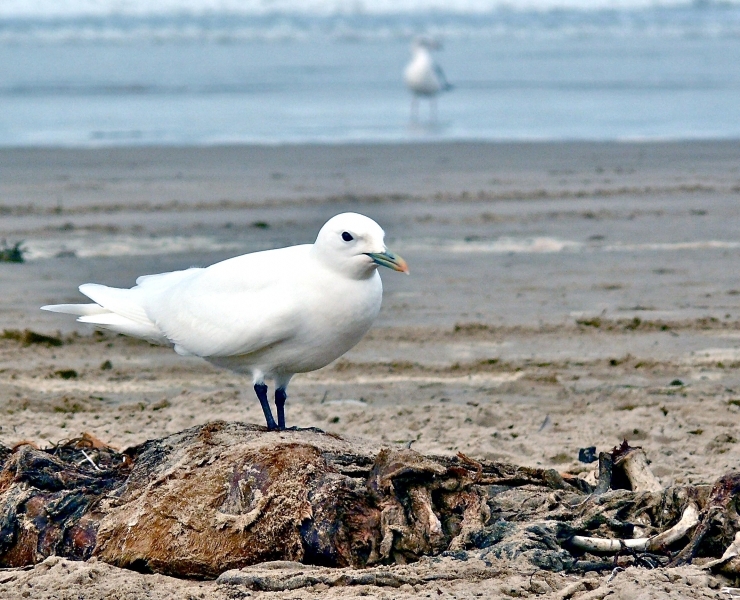 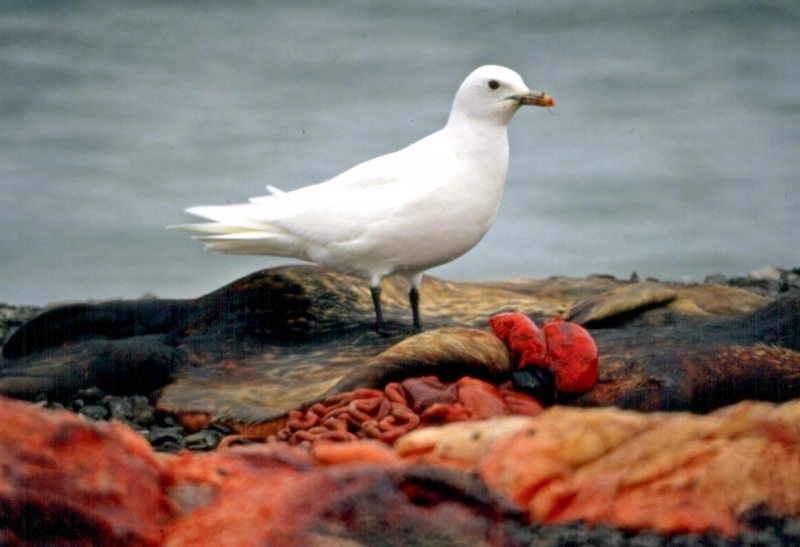 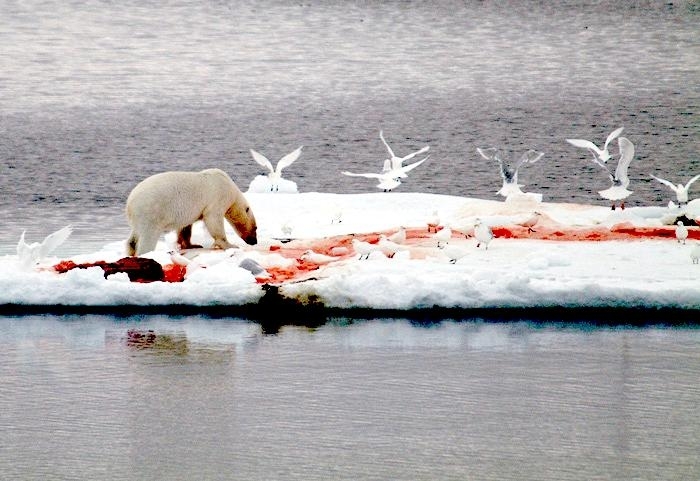 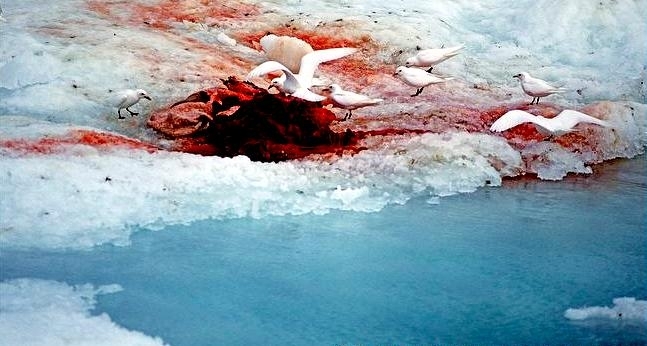 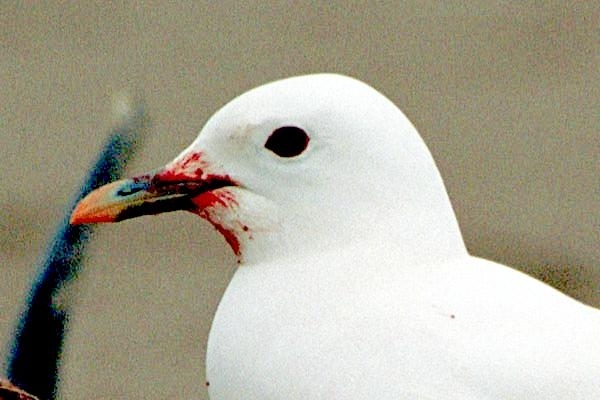 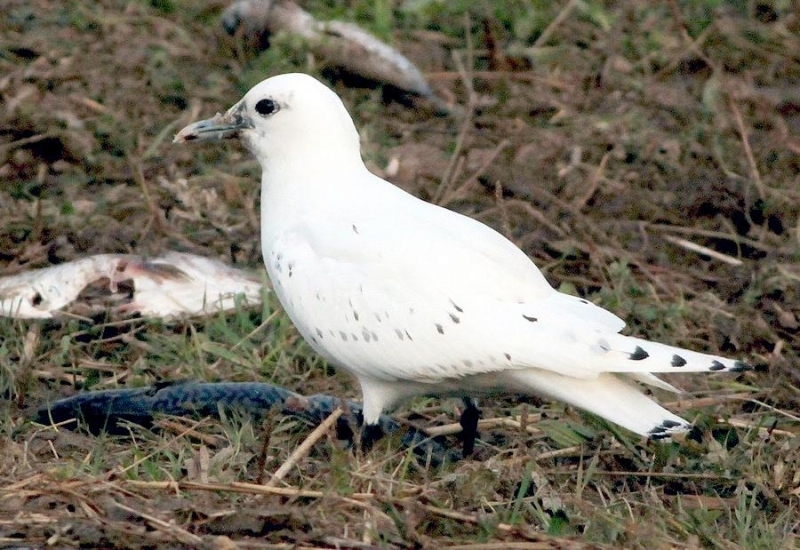 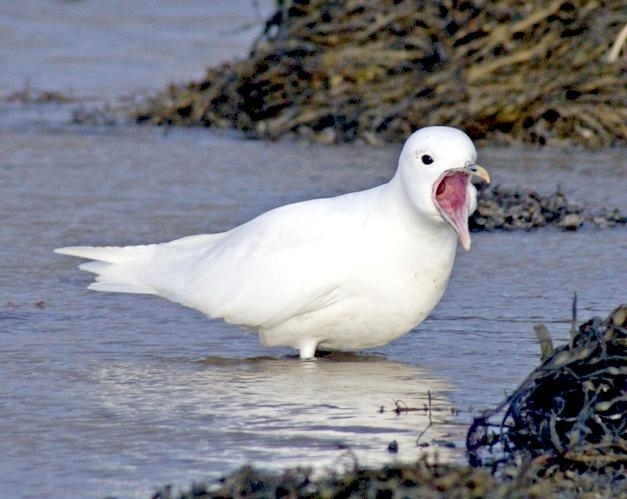 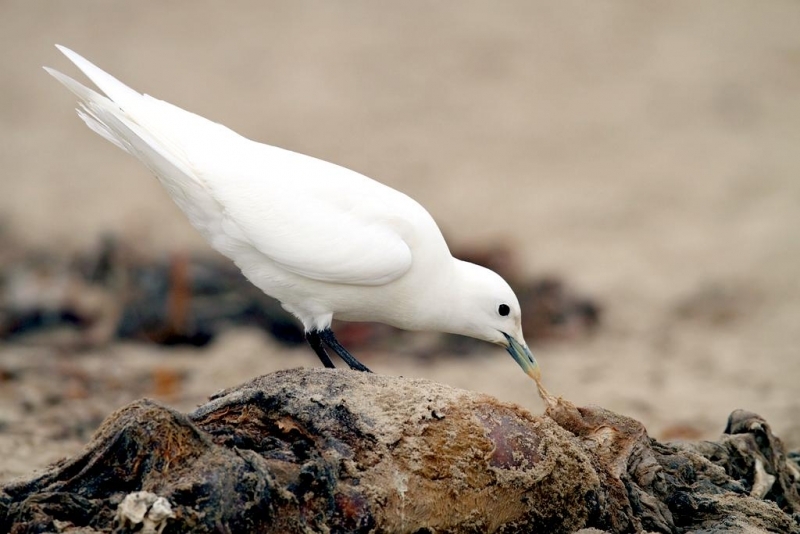 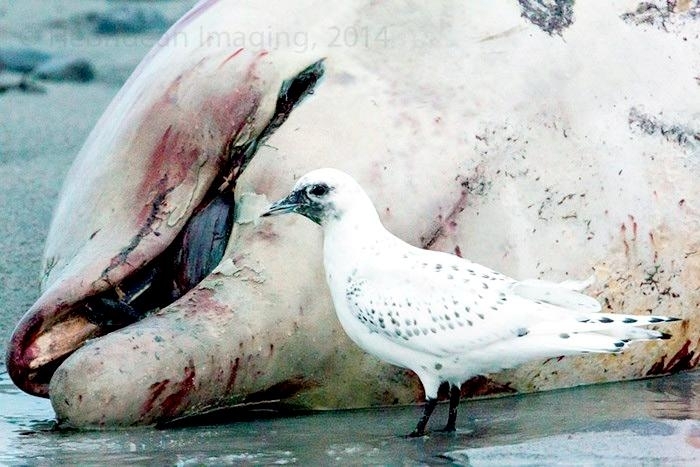 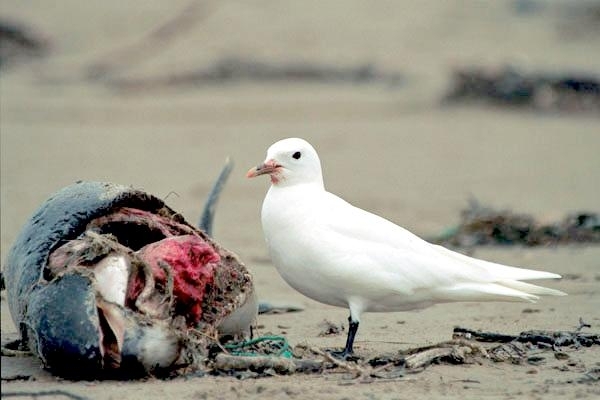 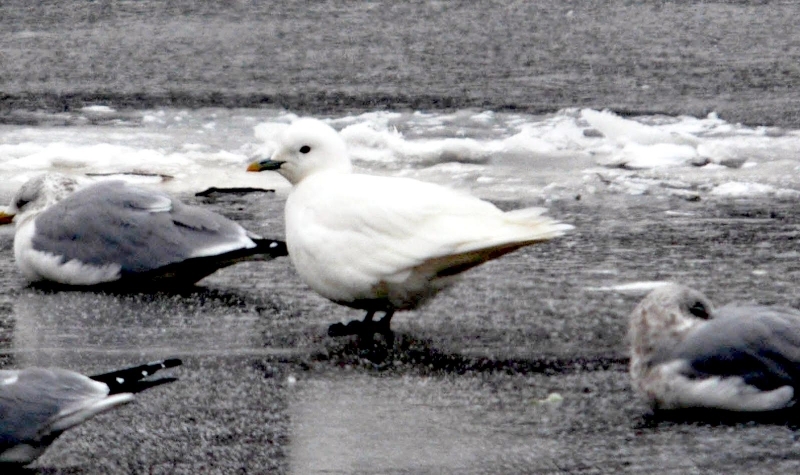 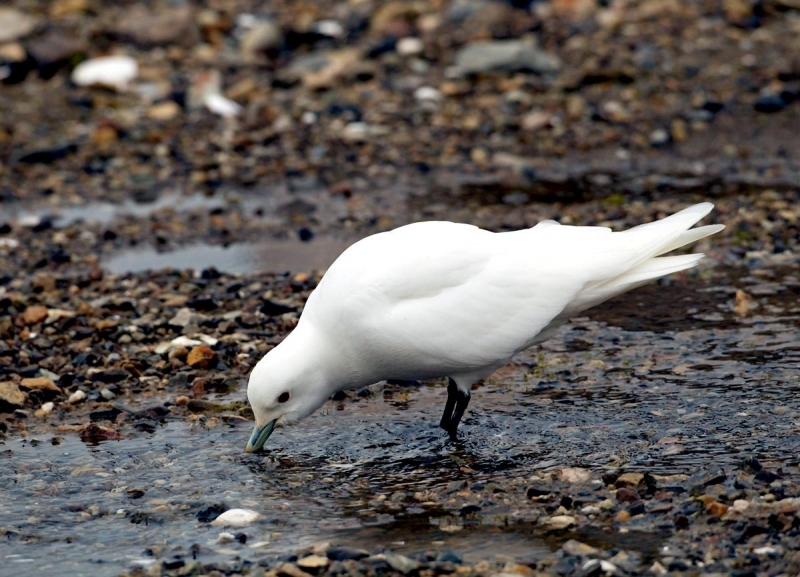 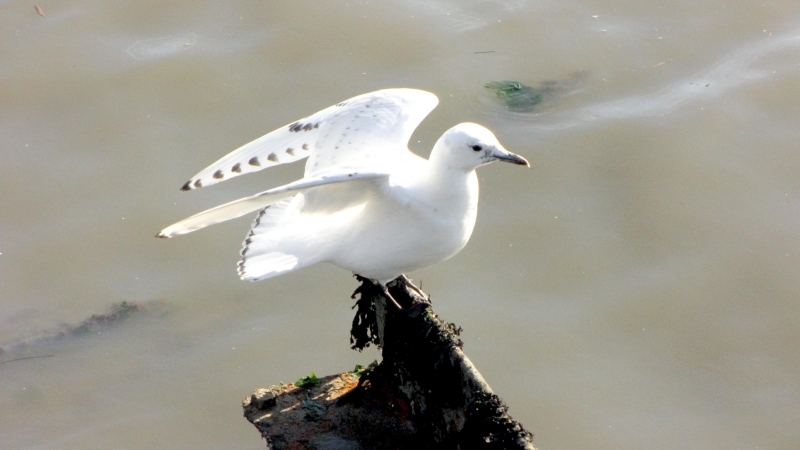 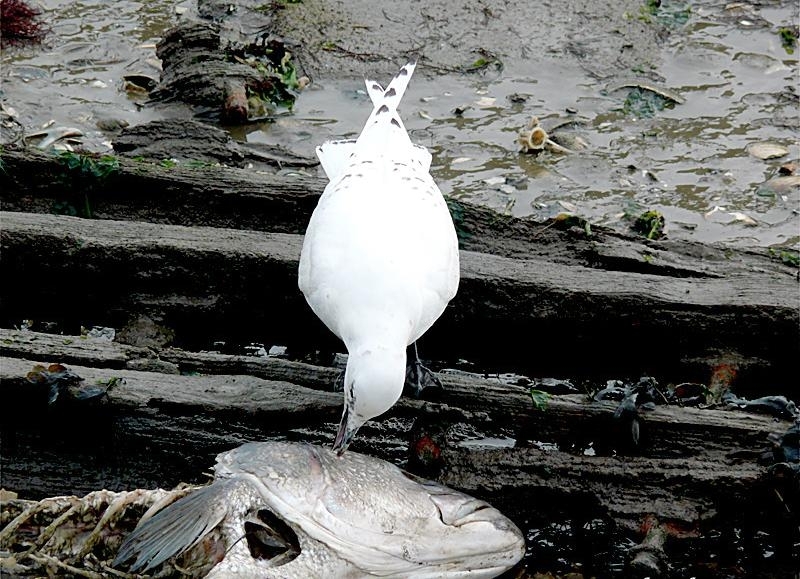 An opportunistic feeder, an Ivory Gull often consumes the carcasses of dead fish & marine creatures. 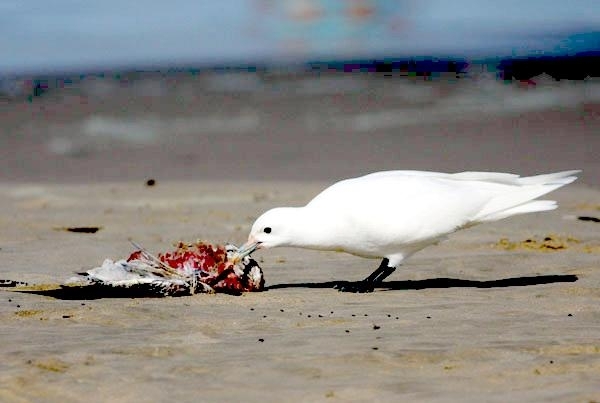 The Ivory Gull often will act as a scavenger, stealing prey from other birds and also will look for feeding whales to scoop out animal plankton from the water. 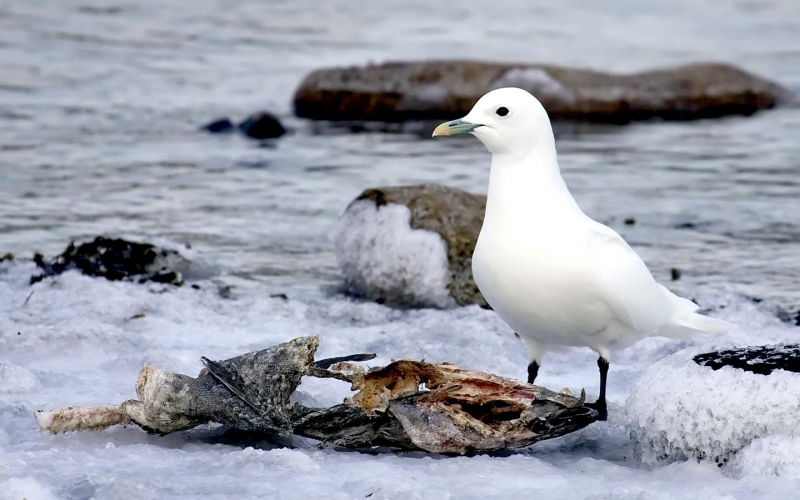 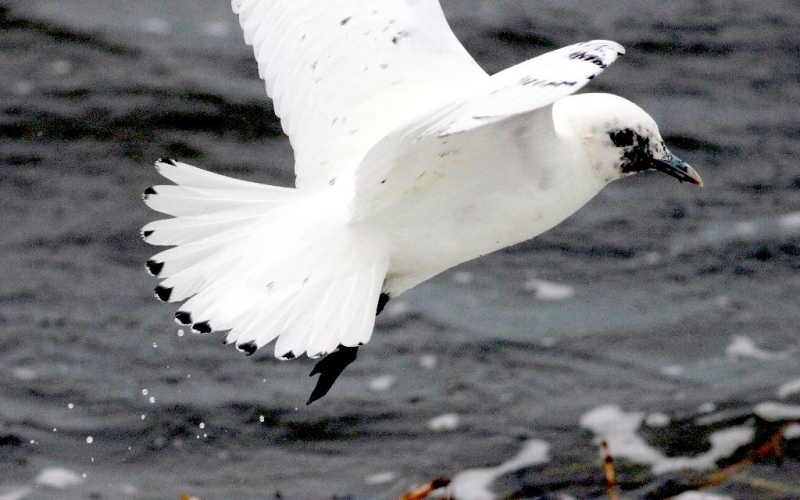 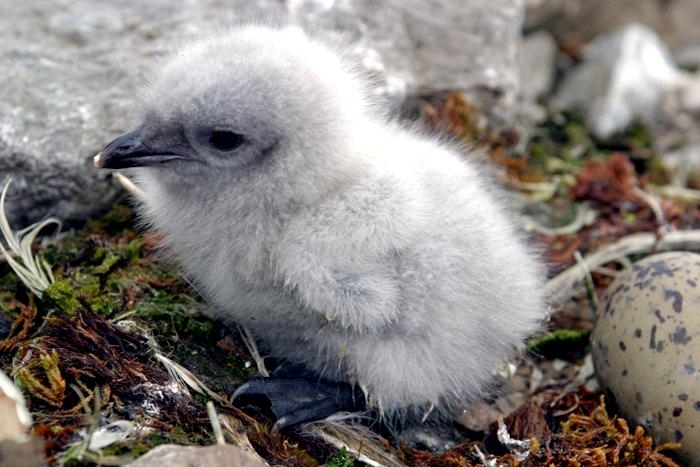 The diet of the Ivory Gull also includes lanternfish, squid, lemming and cod. 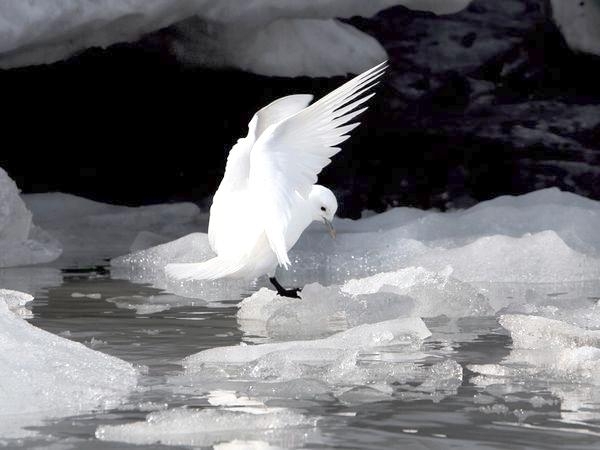 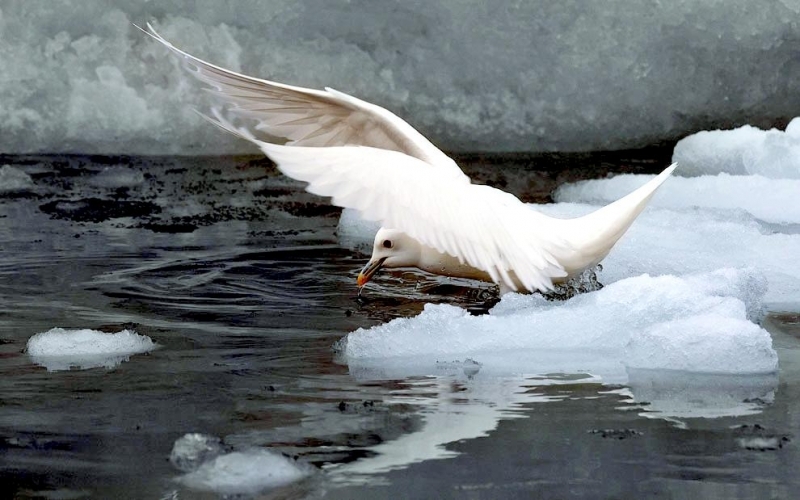 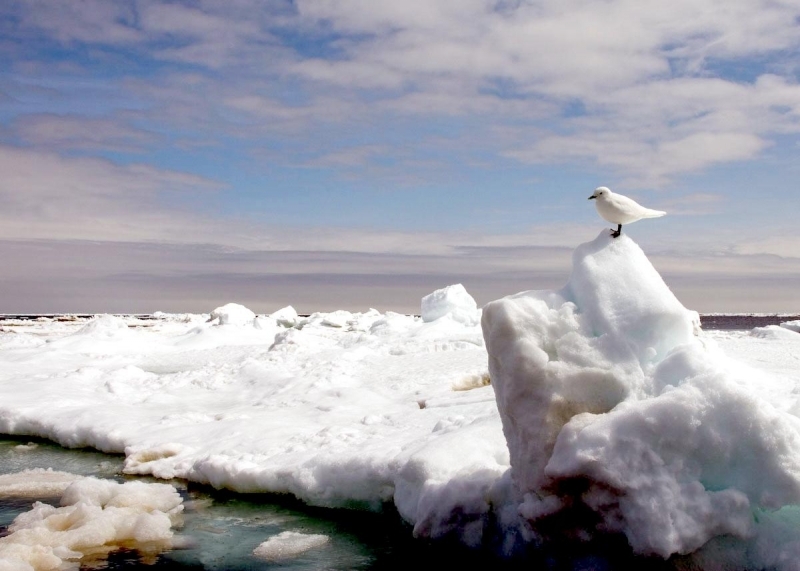 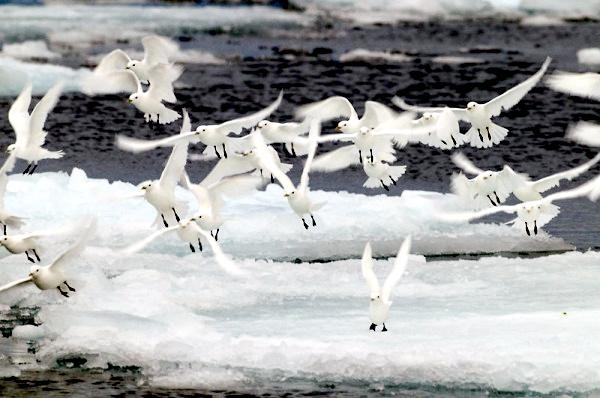 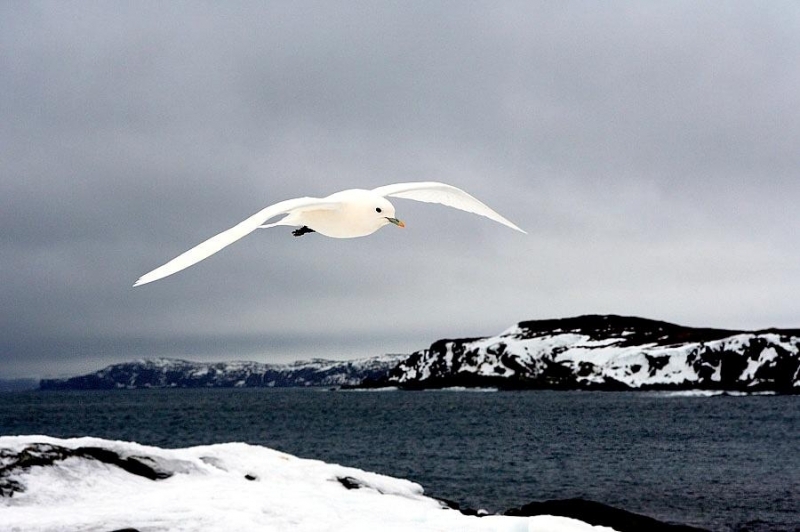 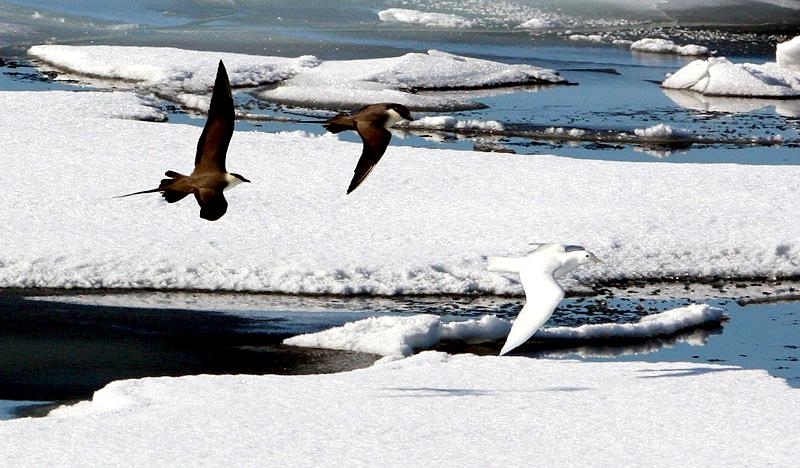 These seabirds migrate around the flow of ice. 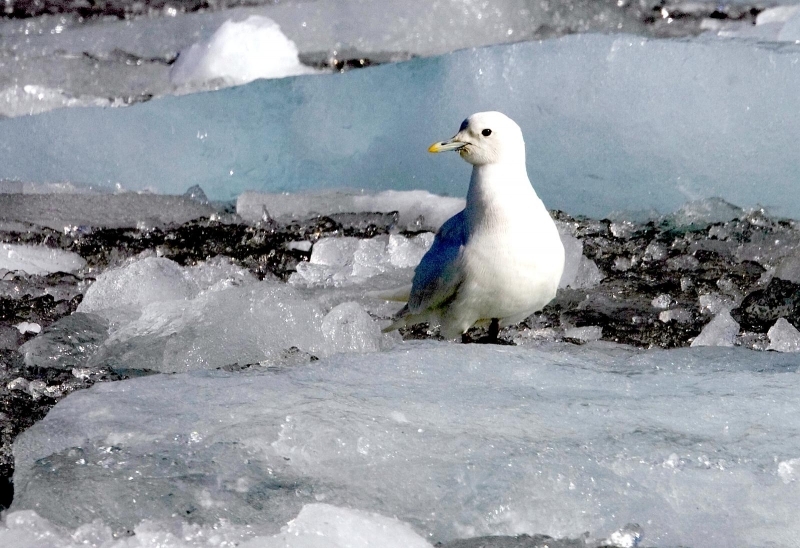 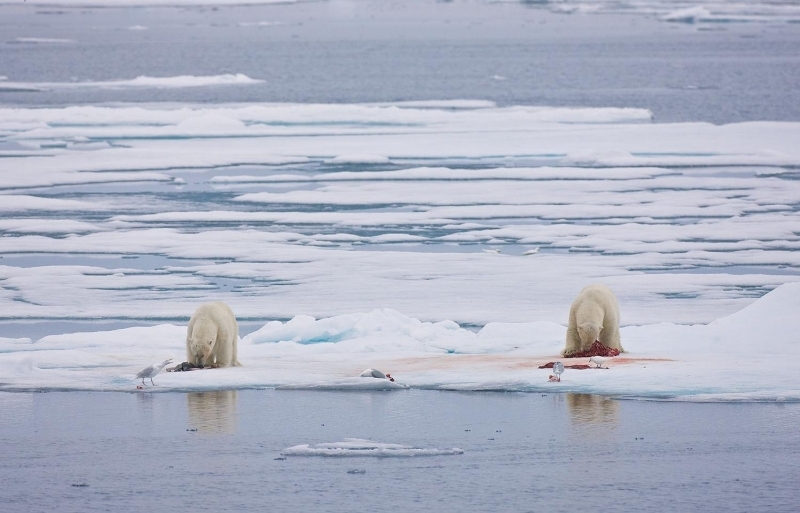 After the breeding season, they travel to the open seas where food is more plentiful and follow growing ice flows. 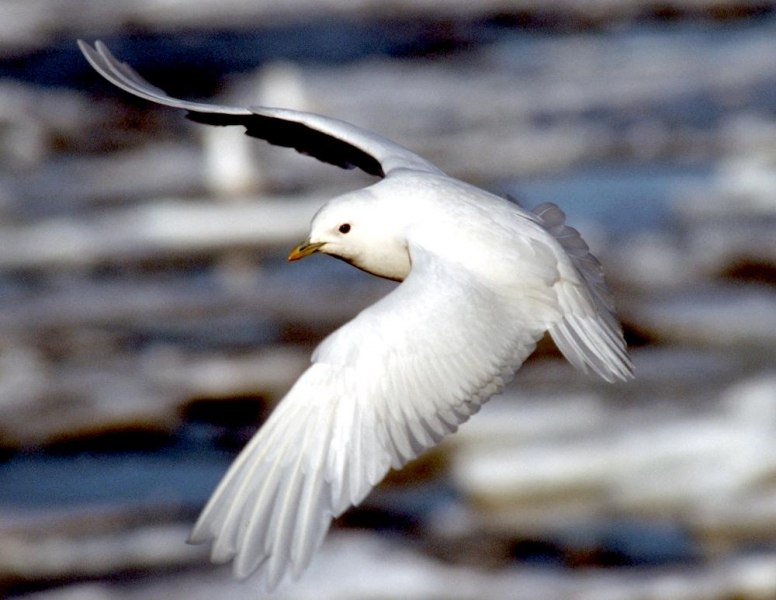 The birds may migrate by themselves or with dozens of other gulls. 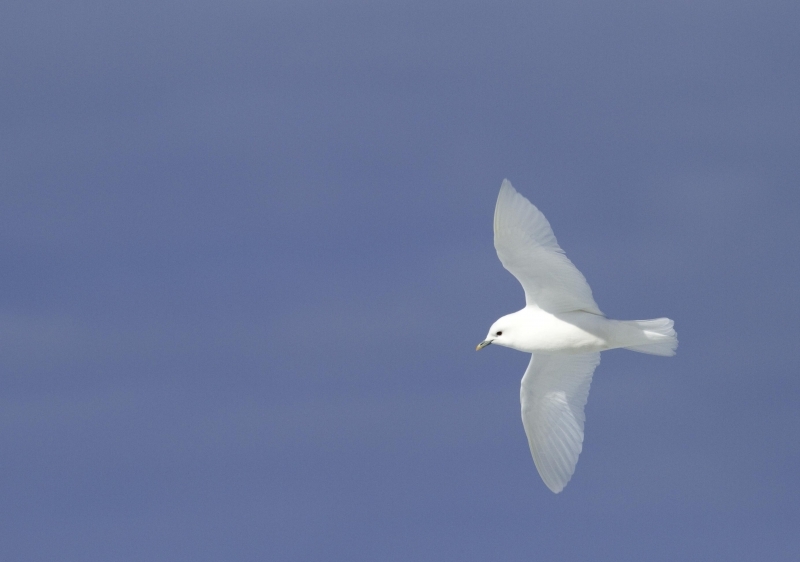 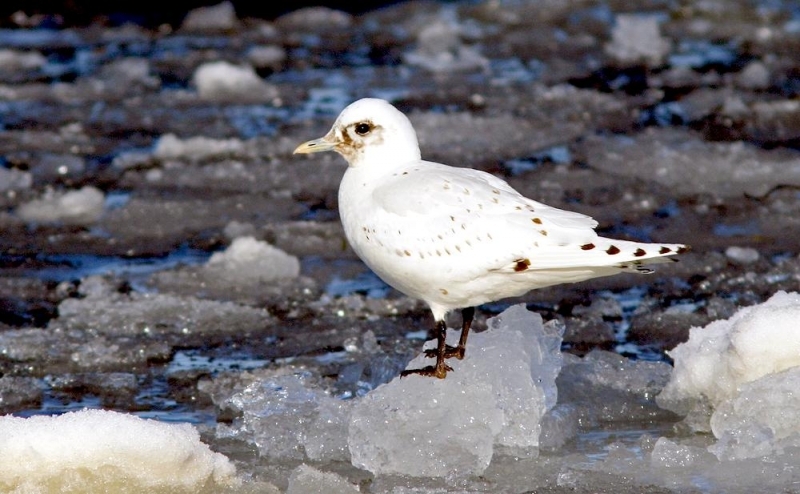 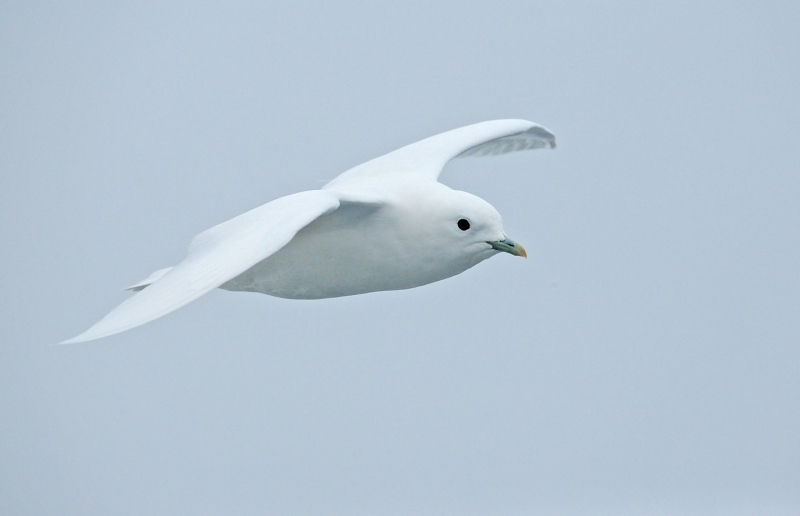 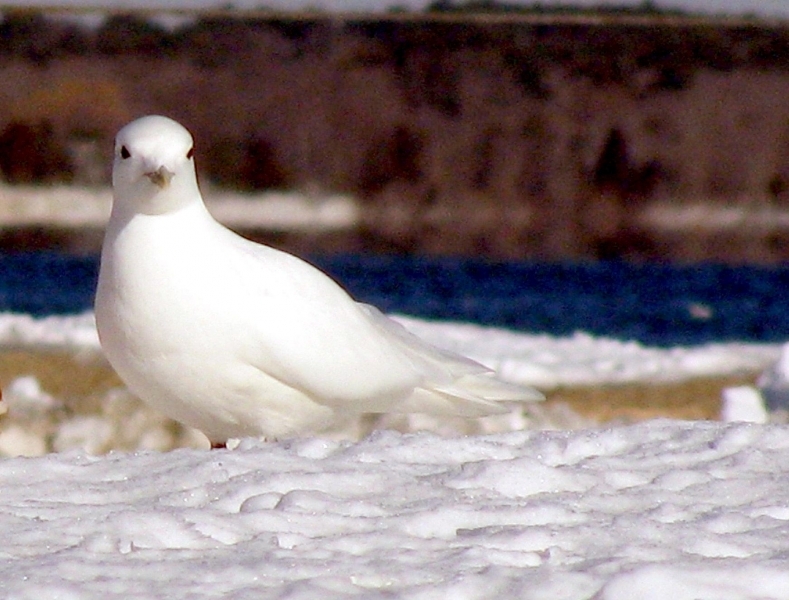 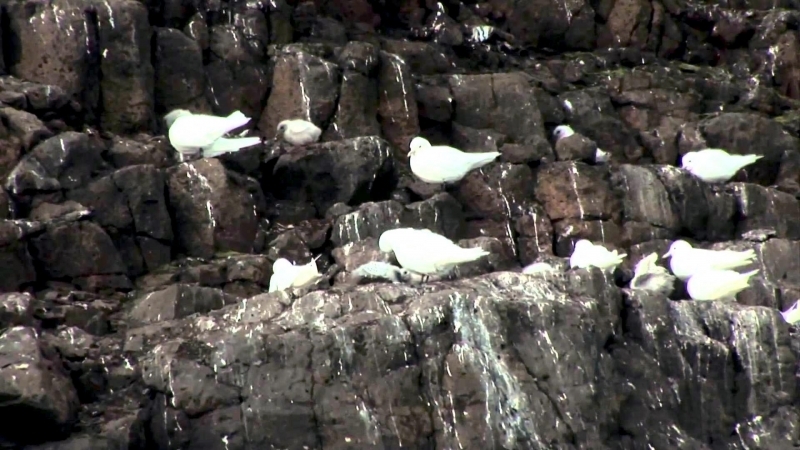 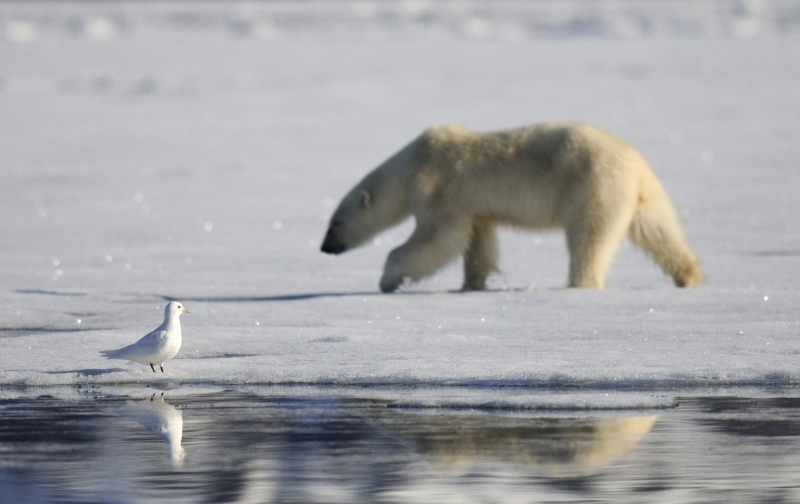 An endangered species, the Ivory Gull’s numbers are hindered by predators & weather. 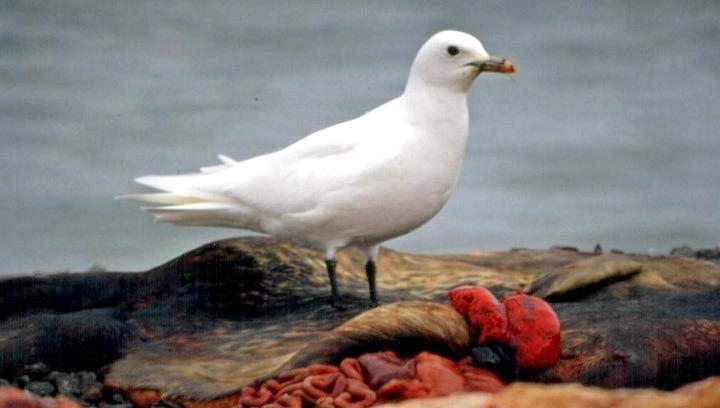 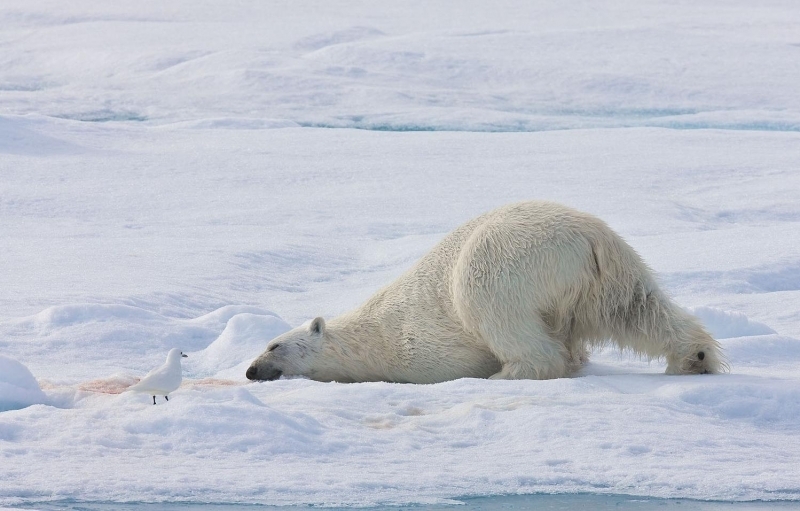 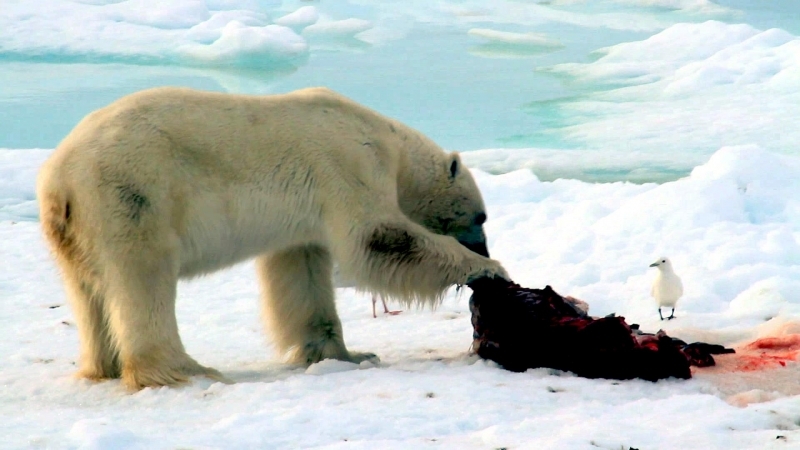 Polar Bears and Arctic Foxes are creatures that threaten the Ivory Gull population by eating all of the eggs & chicks in a colony. 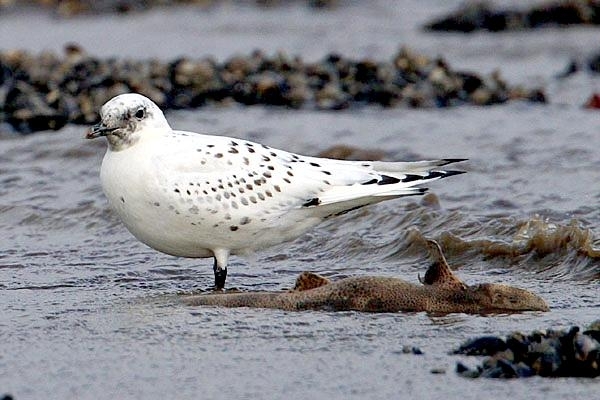 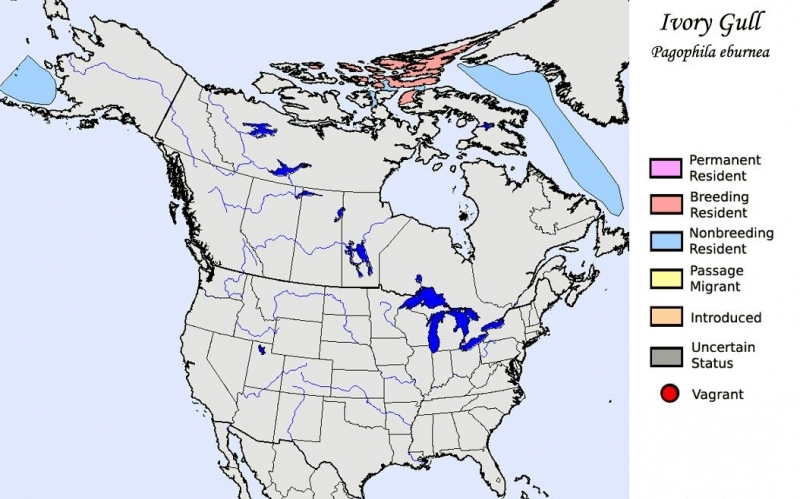 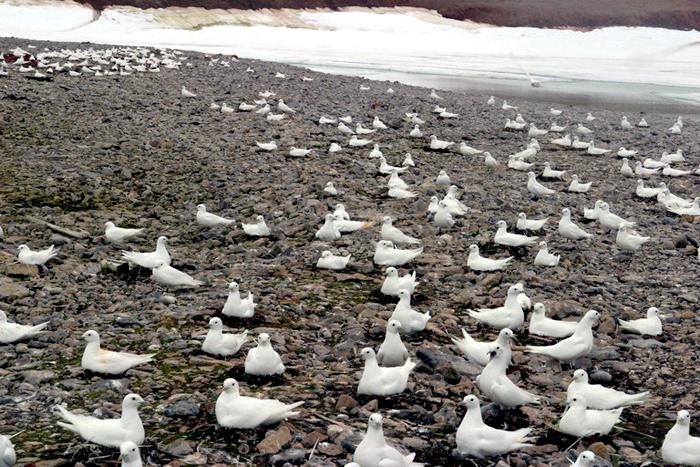 Caribou migration routes also threaten nests of Ivory Gulls during the winter & spring. 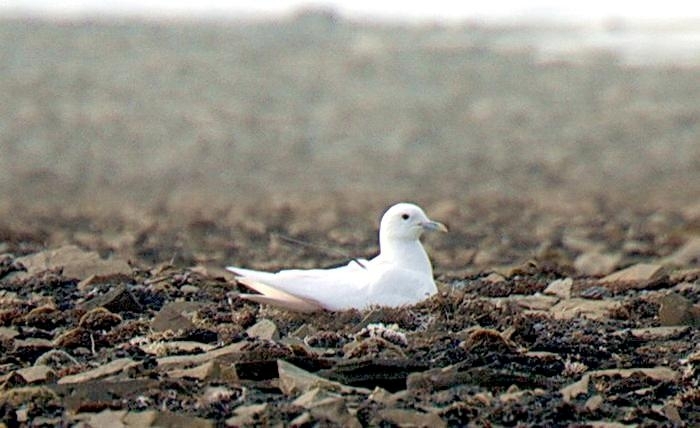 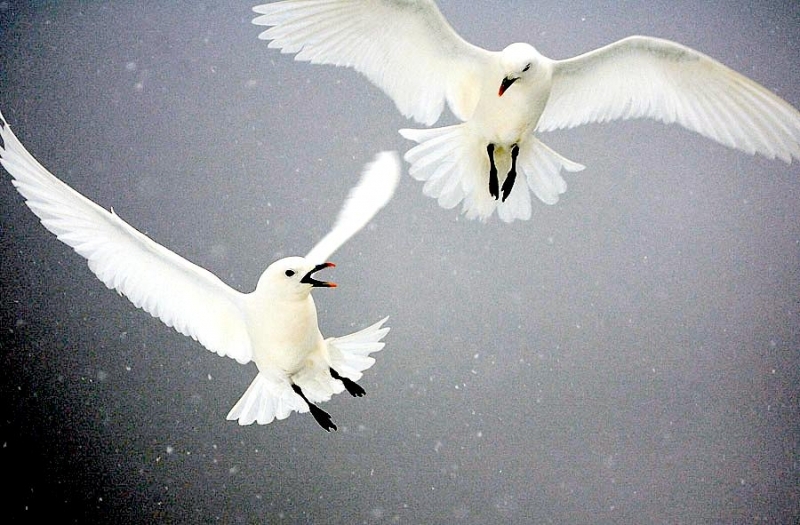 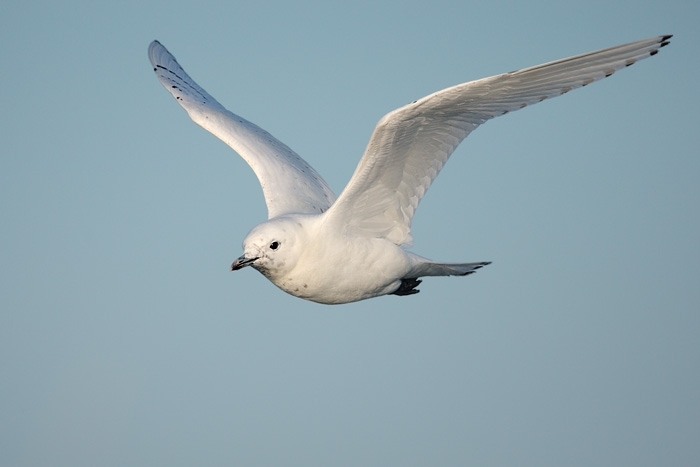 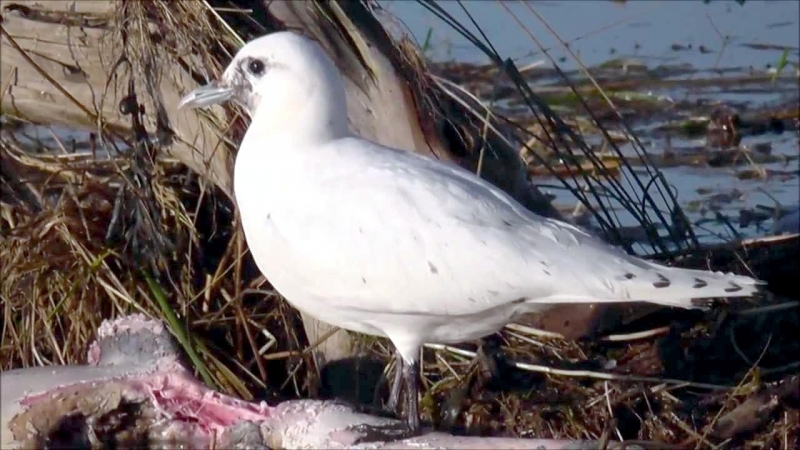 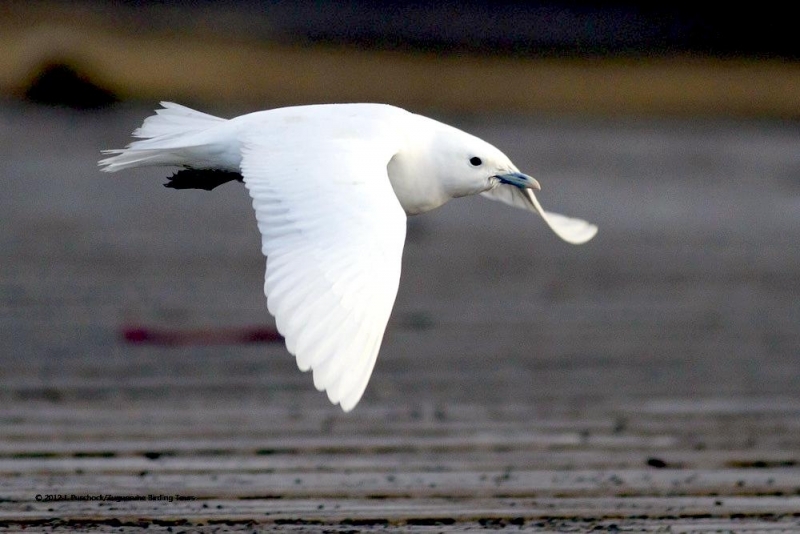 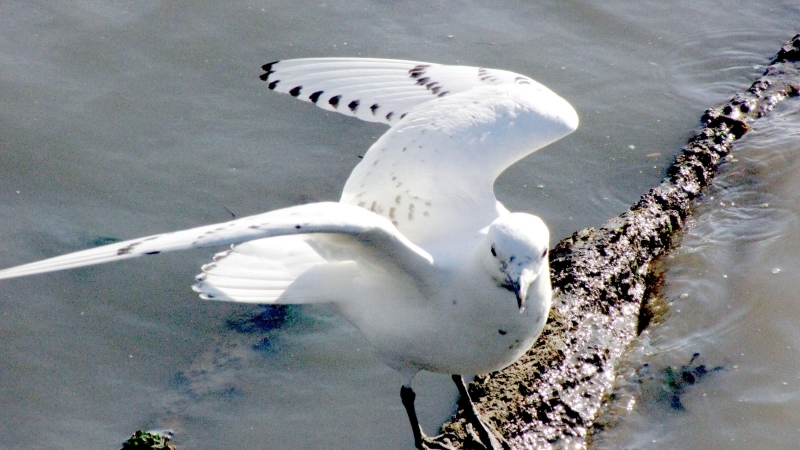 Harsh Arctic storms can also wipe out populations of adults and other disturbances such as low flying aircraft, can cause Ivory Gulls to desert their eggs.